Some of the customers on Brandon Hundley's route likely have never poured milk out of a glass bottle. Some of them may remember their parents or grandparents having a metal milk box on the porch, or even heard stories about how they used to leave a check out for the milkman to pick up each month. They are quaint images of nostalgic Americana, remnants of a bygone era. Long gone are the days of thick, clinking milk bottles, but even in this modern age of automation, milkmen still deliver the freshest dairy products, and retain a sense of connection to customers and their communities. That's no more truer than for Hundley, a long-time delivery driver for Smith Brothers Farms, who has for almost a decade been providing convenience and service to the military residents of Joint Base Lewis-McChord (JBLM). "I'm going on 10 years of delivering to customers," said Hundley. "I love getting to know my customers, their families and stories, as JBLM is a very special part of the Pacific Northwest community. It's such a pleasure to service." Hundley's brief background on the Smith Brothers' website notes he likes his delivery driver role exactly because of the customer interaction, and he enjoys offering the best customer service possible. When he's not delivering dairy, his pastimes include softball, camping and fishing. Of course, a prime part of his off time is hanging out with his son. "I hope to make weekly routines a little easier by delivering our milk, eggs and a variety of products to families busy with hectic schedules," Hundley said. These days, Smith Brothers offers much more than milk, butter and eggs. And while the milk box on the porch remains, it's the last vestige of retro style, with everything else about the system -- other than the actual delivery -- automated and online. Customers simply go to the company website, smithbrothersfarms.com, to sign up for delivery service, which is available to single-family residences. "Customers get an email explaining how everything works," said Peter Olson, the dairy's marketing director. "In the past several years, we have made a real leap in the technology area. We make it an intuitive, easy process for you to make or change your order." He noted this is a scheduled weekly service, not on-demand. However, you can make adjustments to your order up to 6 p.m. the night before your delivery day, which on base is Thursdays. "There's no contract or commitment," Olson pointed out. "You can skip a week -- however, it needs to work for your schedule. "Our service saves people time and energy, and it's the best way to get fresh, local milk," he continued. "We milk every day, and it's on people's porches within two days. The feedback that we get is that people choose Smith Brothers because of the freshness. And these days we try to serve a little bit more than milk." 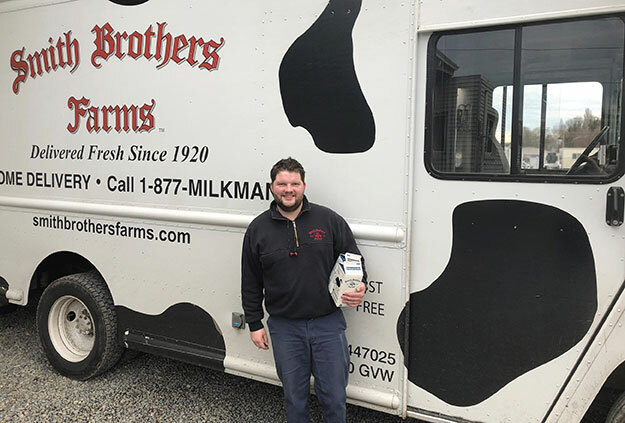 In addition to dairy products, Smith Brothers has, for years, partnered with local artisan producers to offer its customers more delivery choices. Just a few examples are fresh pasta from Cucina Fresca, cakes and breads from Alki Bakery, Cougar Gold Creamery ice cream, Crowd Cow beef, Beecher's cheese, coffee from Stumptown Coffee Roasters, and Erin Baker's baked goods. Great products and selection, though, are just part of Smith Brothers' equation for quality customer service. "Instead of random delivery guy, your Smith Brothers Farms milkman is the same every week," Olson explained. "In some cases, they have served the same families for generations." He said drivers are quick to offer half pints of chocolate milk to kids and treats for dogs along their routes. "They are a part of the community." Smith Brothers itself has been part of the regional community since 1920, when Benjamin F. Smith got the dairy started with a single cow and a handful of customers. Since 2013, the Kent-based operation has been producing USDA-certified organic dairy products, with organic milk from Pacific Northwest cows that are pasture-raised and grass-fed -- weather permitting -- and supplemented with certified organic feed. As for the old-school milk bottles? Light exposure was found to harm milk quality, so recyclable cartons were adopted by the dairy in 1965. Whatever type of packaging it's dropped off in these days, dairy delivery to Hundley is a way to give back. "Servicing JBLM is such an honor to do for our military families," he said. "As they serve us, I hope to help serve them ... delivering milk with the great American tradition of the milkman."